Guests are welcome anytime between 5pm (4pm in Winter) and 7.30pm - please advise us if you are going to arrive late. 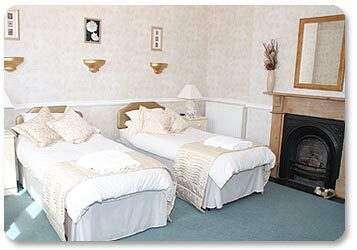 The bedrooms in Bron Heulog are comfortable and well furnished, with central heating and heated towel rails. All have original Victorian fire places and high ceilings. 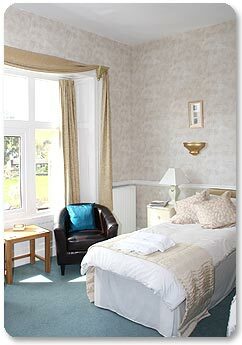 A very spacious and comfortable twin-bedded room, beautifully decorated in cream & gold. The large window overlooks the village and the Berwyn mountains beyond. Colour television, tea/coffee making and full en-suite facilities with shower. 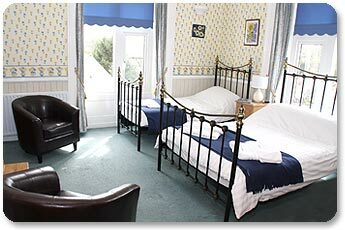 The Sunflower Room is a large bright double bedded room benefiting from the morning sun through dual aspect windows, one overlooking a weeping ash which is over a hundred and forty years old. From the other window there are lovely views of gardens and the mountains in the distance. Sunflower can also be used as a family room (single bed available). Colour television, tea/coffee making and full en-suite facilities with shower. A pretty double bedded room, decorated in sky blue with co-ordinating fabrics. The view from Bluebell overlooks gardens and the village, with the Berwyn Mountains in the distance. 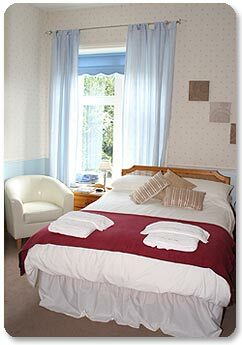 The Bluebell Room has colour television, tea/coffee making and full en-suite facilities. Sunflower is our family room and can sleep 2 adults and one child. Children under 8 stay free of charge. Packed lunch tariffs are available on request, please contact us for more information.